These are truly unprecedented times. Central bankers have never had more power; monetary policy has never been stranger. Stock markets are at record highs, but the real economy is stagnate and suffering. The individuals in it are finding it difficult to makes ends meet, and are drowning in debt. All the quantative easing went straight to the top; investment had literally no incentive to flow into the larger body. The system is top heavy, topsy turvy and weak in the knees. Collapse appears inevitable, yet could be a long way off. Whatever happens next, no one can say, but we are approaching the limits. Even Lord Jacob Rothschild, from perhaps the foremost financial dynasty in history, seems aghast at the possibilities. Of course, everyone pays attention when the elite of the elite speak up about financial matters. Low interest rates, negative yields on government debt and quantitative easing are part of the biggest financial experiment in world history, and the consequences are yet unknown, says RIT Capital Partners Chairman Lord Rothschild. “The six months under review have seen central bankers continuing what is surely the greatest experiment in monetary policy in the history of the world. We are therefore in uncharted waters and it is impossible to predict the unintended consequences of very low interest rates, with some 30 percent of global government debt at negative yields, combined with quantitative easing on a massive scale,” Rothschild writes in the company’s semi-annual financial report. The banker notes this policy has led to a rapid growth of stock markets… However, the real sector of economy didn’t enjoy such a profit, as “growth remains anemic, with weak demand and deflation in many parts of the developed world,” according to Rothschild. Lord Rothschild is openly admitting that the system is collapsing on the ordinary workers and average people in society. The American people are reaping none of the benefits and paying all of the costs for an unprecedented banking experiment that is fundamentally leaving the branches of middle class and working society to wither on the vine. The banking class have reached out a hand to extent debt, dilute the currency and to entrap people in the circumstances of serfdom once again. Wages are not going up, good jobs are not being created and people are underemployed, underutilized and mismatched with their education and training. The value of human labor – easily offshored, outsourced or replaced by robotics and computing – is in sharp decline. Student loans, credit card debt, auto loans and more have saddled the individuals and society in general in crisis after crisis with no end in sight. A wave of defaults could trigger a new era of economic crisis. Independent businesses have the hardest time attracting investment, especially in an atmosphere where investment, savings and insurance are punished by low or no interest rates and the declining purchasing power of the dollar. On the individual level, the cost of living is squeezing the life out of everyone. The energy must come from somewhere, and they are taking it from everybody. Rising costs in both buying a home and renting, skyrocketing (mandatory) health care costs, and increases in food, labor and especially utilities and municipal services are all draining the net income of a household or individual to spent on what is needed. The lack of disposable income means that extra spending is cut, and all the potential venues of commerce are passed up, and less goes around. The pumping up of the stock market allows insiders to cash in on premium prices (and overvaluations) while enticing suckers into a market that is unsustainable. The Federal Reserve’s quantitative easing program is picking winners and losers, and the losers are mostly on main street and bumming around for a handout. The federal government throughout the entire Obama Administration has been advertising SNAP food stamps programs and welfare, with niche targeting for inner city, immigrant and rural poor recipients. Nearly 50 million Americans rely upon government services to eat. The massive cost of the programs further strains an already broke and mismanaged government; some say the whole point is to overwhelm the system and force new investment into the crony partners who hold the contracts. Either way, the working poor are encouraged to take handouts rather than finding work and regaining mobility. The longer term future – filled with robots, artificial intelligence and an enormous wealth gap – is one which has no particular need for humans. 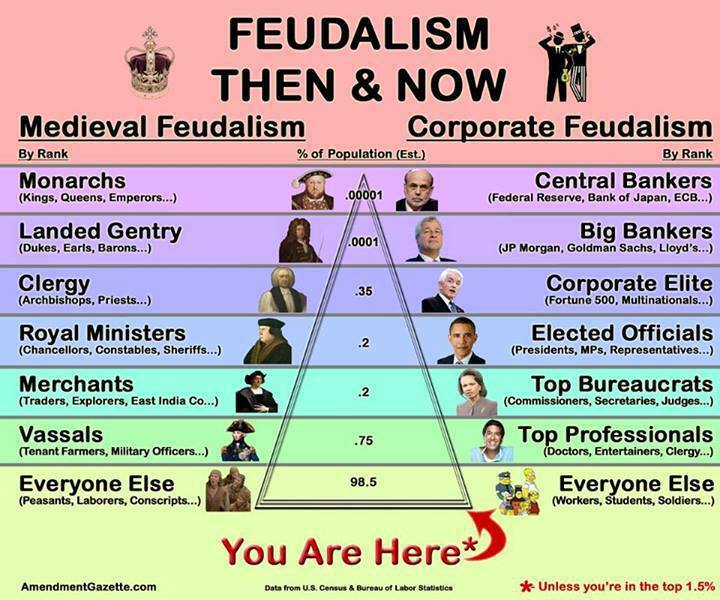 Average people are being pushed back down into serfdom – feudal arrangements put you in a circle of perpetual debt from which escape is futile – working to pay off rent, taxes, food and digital appliances without a thing to pass on to the next generation or claim as your own. There is so little need for human labor, that technocratic governments grant a living allowance. The gesture, even perhaps well-intended, is ultimately quite demeaning. The power of the dollar rests on the arrangement of the petrodollar, and the strength of the American empire. These things are fading from power, and the future is indeed uncertain and unprecedented. Perhaps Lord Rothschild is remarking upon the engineered collapse of society not because he is truly surprised, but rather due to an anxiousness to see a new form of financial destruction, more specific than past events.